Traditional carport structures have long been a cost-effective alternative to garages and have graduated to full structures sometimes including fascia boards, gutters and downpipes to suit the most discerning customer's requirements. 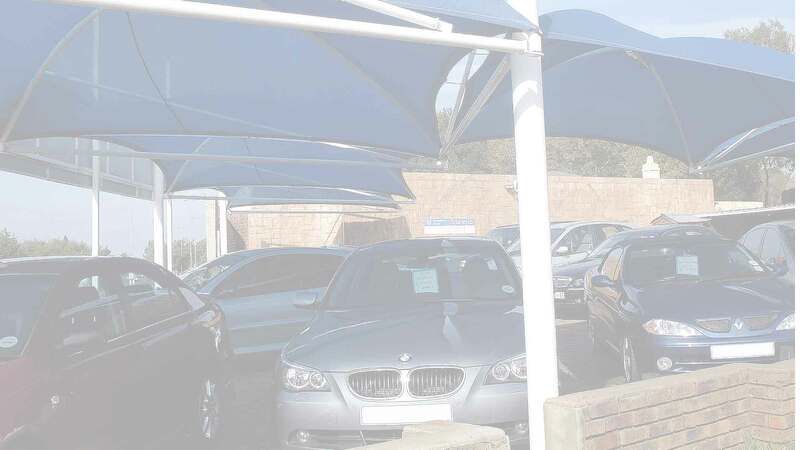 As with shadeport structures, traditional carports also offer protection against wind, hail, and sun. We offer a complete service, from supply and erection of the standard structures to the manufacture of special structures to suit your specific requirements, including non-standard sizes and shapes, including tunnels, tents and pyramids. Support legs/columns are mild steel tubing. Sheeting is either supplied as sheeting 27 or IBR profile and is either cold rolled, galvanised or chromadek finish. Lip channel is mild steel. All parts are either welded or bolted together. For standard applications, columns are concreted into the ground or rawl bolted to surface as per requirements. All mild steel is treated with an anti-rust coat of red oxide primer and then finished with a colour coded quick dry enamel, as per customer's requirements. Due to the nature of the material used to construct carports, the most common maintenance regime is practiced in order to prevent rust and/or leaks. Therefore, roofs must be kept clear of leaves and other objects posing obstruction possibilities to the gutters and down pipes. Additionally, columns need to be sanded and repainted from time to time. Other than this, carports require little or no other maintenance at all. Flat topped carport, both standard 4 column and cantilever. This structure consists of 4 upright columns – one at each corner of the structure supported by purlins and lipped channel. It is available with or without gutters. A-framed carport, both standard 4 column and cantilever. This structure consists of either 4 columns or only 2 upright columns – planted at the back of the structure, with a pitched roof design. The structure is available with or without fascias. Arched carport, both standard 4 column and cantilever. This structure consists of 4 square tube columns planted at each side of the structure. Rectangle rafters and purlins ensure stability of the structure and the IBR sheets are fastened with screws. Hip-shaped/Hip-roof, both standard 4 column and cantilever. This structure consists of 4 columns, one at each corner and is a standard structure. The Hip Roof structure is a design preference and is no more costly than the standard structure.